Local 1000 members provide an endless variety of critical services that directly benefit our state and our communities. Among our 95,000 unionwide state workers who keep our communities healthy, safe and strong are the Public Utilities Regulatory Analysts, or PURAs. PURAs play a critical role in ensuring our state moves to renewable energy sources, has safe water delivery and access to vital services – such as the ability to dial 911 – for all California families, regardless of income. And PURAs are leading the way to keep it that way. They are currently active in speaking with legislators about a harmful bill that would strip authority from the consumer protection commission and give more power and influence to industry lobbyists. The bill would open the door to deregulation and give corporations like AT&T more political influence. And no one is more equipped to speak on this issue than PURAs. PURAs regulate the very companies that provide electricity, water, transportation services and telecommunications such as broadband to our homes and businesses. Through research, policy and public engagement, PURAs help make services and renewable energy sources affordable and accessible to families throughout the state, including to rural and disadvantaged communities, so that everyone has equal access. They are focused on closing the digital divide through helping to provide affordable telephone access, broadband infrastructure and by administering funding programs so that public schools, community colleges, public housing and rural communities can obtain affordable broadband services. PURAs also help ensure that water service delivery from water utilities is consistent with state public health standards, helping to keep Californians healthy and safe. From developing charging stations for electric vehicles to designing programs and incentives for people to actually afford and access renewable energy, PURAs help to reduce air pollution and combat climate change so that our kids, grandkids and future generations have a safe place to live. “Local 1000 members go above and beyond to provide great services to California families every day. 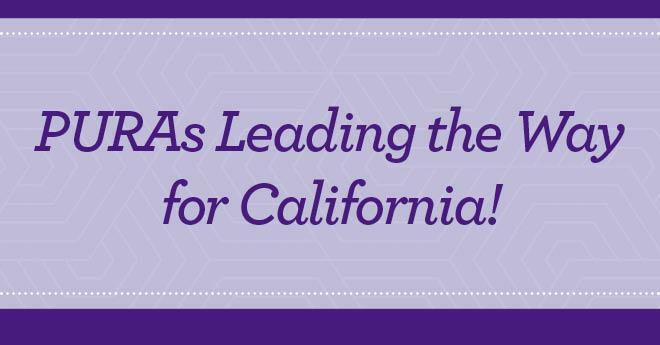 PURAs are a great example of how we keep California healthy, safe and strong,” said Yvonne R. Walker, President of SEIU Local 1000.